Entering the 2014 postseason, few would have imagined Jussi Jokinen leading the league in goals this spring. Yet, following Wednesday night's action, he's doing just that, pacing (along with Marian Gaborik) the NHL with six tallies in ten contests. What's more, his nine points rank second (tied) in team scoring, as Pittsburgh has jumped out to a 3-1 series lead in their second round matchup against the Rangers. 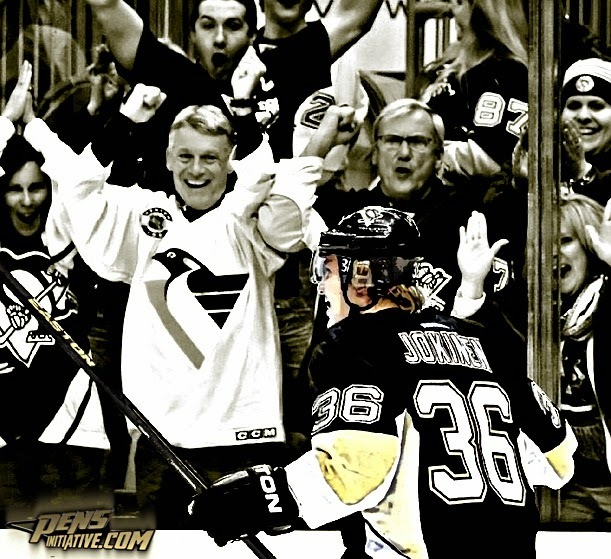 Now, it's almost hard to imagine where the Pens would find themselves without Jokinen's contributions. But, with the versatile 31-year-old potentially headed for free agency this summer, his consistent production may create an issue if Ray Shero hopes to retain the skilled winger (or center, depending on the situation). After all, conventional wisdom suggests Jokinen will command more than the $3 million he currently pulls in each year and it's not likely that Shero will, once again, convince Carolina to pick up a chunk of any deal moving forward. When Sidney Crosby went down with a broken jaw late last season, the Penguins needed help down the middle. And, with Jokinen having recently cleared waivers, Shero identified the Hurricanes' center as an ideal candidate. In exchange for Jokinen, the Pens surrendered a conditional draft pick but Shero swindled the 'Canes into picking up nearly a third of Pittsburgh's newest acquisition's salary, making Jokinen's cap hit much more manageable. The move paid immediate dividends, as Jokinen registered 11 points in Pittsburgh's final ten regular season contests, filling in admirably for the fallen Crosby. When the club returned to health in the postseason, however, Jokinen saw limited action, posting just three assists in only eight contests. But with a new year came new opportunity. 2013-'14 afforded Jokinen a chance to round out the Pens' top-six. One of the few Penguins to enjoy a relatively healthy season (he played in 81 games), Jussi chipped in 57 points, helping the Pens overcome a plethora of injuries en route to another division title. In the playoffs, Jokinen has evolved into a monster, collecting a point in all but one of the Penguins' ten contests. While some of Pittsburgh's stars have produced sporadically to this point in the postseason, it's largely been Jokinen's current eight-game point streak (including three game winning goals) that helped pick up the slack, placing Pittsburgh on the cusp of the team's fourth Conference Final appearance in seven years. Ray Shero can look forward to a hectic summer. With the likes of Brooks Orpik, Matt Niskanen, Jokinen and a host of others headed towards free agency, no shortage of decisions await the G.M. Add to that any potential free agent signings and/or trades and Shero clearly has some decisions to make in the near future. At first glance, retaining Niskanen may come across as Shero's ultimate priority. After all, the blue liner's game reached a new level this year, as he anchored a defensive unit decimated by injuries for much of the season. Consequently, Shero surely won't have much interest in losing out on a 27-year-old defenseman coming off such a dominant campaign, a blue liner potentially evolving into a top-tier rearguard. But, while the Penguins certainly hope to bring Niskanen back next year, they may actually face a more pressing need. Because, while an obscene amount of organizational depth exists along the blue line, the club lacks such a luxury at the forward position. A quick glance at the Penguins signed beyond this year reveals only seven forwards under contract for 2014-'15 and beyond. And, while most of the top-six finds itself locked up, Shero is staring down a potential need to revamp nearly half of his forward group this summer. And, that, is precisely why Jokinen should represent the Pens most urgent priority this summer, at least in terms of unrestricted free agents. Of course, it will depend on term and money but there's no denying the veteran forward can play anywhere in the lineup, whether he's needed to round out one of the top lines or fill a bottom-six role. He can play center, proving effective on draws, or skate on the wing. He's capable of consistently producing offense without serving as a liability in his own end. Who's going to replace all that if Jokinen signs elsewhere? It's certainly unlikely to come from anyone currently within the organization. And, while several intriguing free agents will conceivably find themselves available, will any of them really prove to be more cost effective? If so, will they fit in the system? Time will tell how it all plays out but, in the meantime, all we can do is sit back and enjoy this latest postseason run. And, along the way, watch Jokinen (and Niskanen) continue to earn that hefty raise.